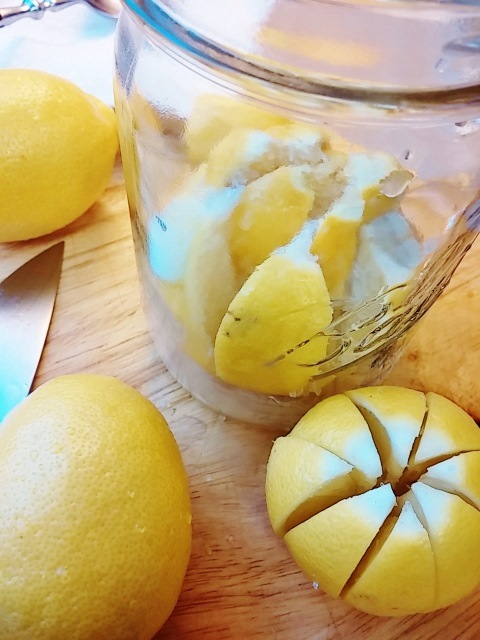 Creating my own preserved lemons has been high on my to-do list for some time now. 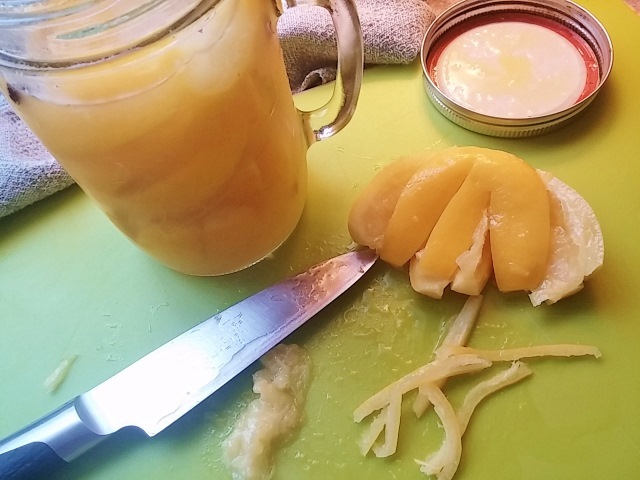 Although there aren’t many components, it took me a while to get it together: organic lemons, a fair amount of good quality sea salt, a suitable jar, and time is really all that is required. Preserved lemons, used in lieu of fresh lemons, are becoming more mainstream and often available in specialty markets. In North African and South Asian cuisine, preserved or pickled lemons can age in salt for months to acquire their unique taste. My speedy version will be ready in about a month. After 1 week on the counter and another in the fridge, I couldn’t wait any longer and I tested my first lemon. The rind was soft with a mellow flavor. Clearly, its growing intensity will echo throughout any dish when cooked. In this case, the rind of only one lemon wedge was enough for a simple yet superb vinaigrette. I’ll let the lemons continue to ripen for a couple more weeks and begin to include them in upcoming stews, one pot meals, and plenty of assorted grains and starches. Cut 6 lemons into 8 wedges each, and remove any obvious seeds. 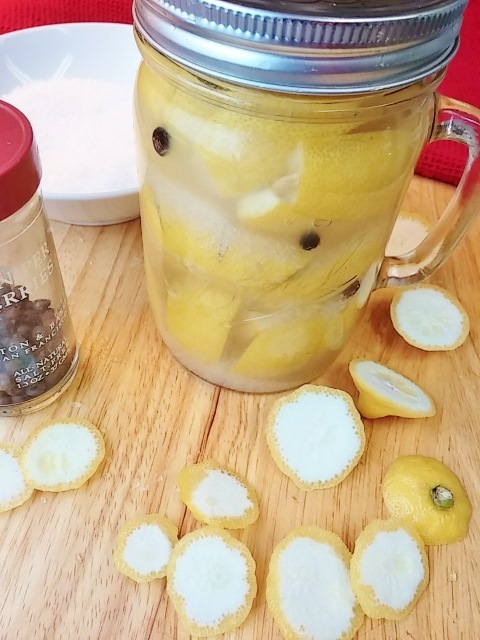 Fill each lemon with salt and place in the jar. Continue to press down the lemons and pack tightly into jar, distribute juniper berries evenly. Juice will be squeezed out of the lemons during the process, if it doesn’t cover the lemons, use the juice from the 7th lemon to fill the jar. Tighten the lid and let stand at room temperature for 7 days. Each day, shake the jar to distribute the salt among the lemons. Add more lemon juice if the lemons are not completely covered. After 7 days, drizzle a little olive oil over the lemons and store in refrigerator for 3 weeks longer, until skin is soft. Test after 2 weeks in refrigerator. Rinse the lemon before using and use the soften rind only. I finally managed to take a quick photo of my favorite rye bread—it is devoured so quickly that I rarely have a chance. This is a light rye—both in flavor and in texture—its slight chewiness and soft crust contribute plenty of character and make slicing a breeze. The addition of a small amount of brown sugar works symbiotically with the rye to fully point up its nuttiness. These are all qualities that translate well for an all-purpose bread: it’s equally good toasted for breakfast, adaptable for a range of mid-day sandwiches, and is a superb accompaniment to hearty soups and one-pot meals. The dough is fairly moist and requires a double-rise that takes time, but it moves swiftly, resulting in a well-rounded, reliable loaf. I use it often and tend to change it up based on my needs at the time. For example, swapping out a mere 1/2 cup of wheat flour for all-purpose flour will make a substantial difference. I also like it free-formed into a boulé of sorts, with an egg wash brushed on the exterior for a thicker, firmer crust. See the cornmeal-crusted rye variation that follows, and don’t be surprised how quickly it disappears! In a 1-cup measure, combine 1 tsp. of the sugar and 1/4 cup warm water; sprinkle the yeast over it and stir to dissolve. Let stand in a warm place until bubbly, 5 to 10 minutes. Place dough in a well-oiled bowl, cover, and let rise in warm spot for 1 hour until doubled. Butter 9×4” loaf pan. Punch down the dough and turn out onto floured surface. Knead again for 1 minute, place dough in the loaf pan, cover, and let rise another hour. Preheat oven to 375°. Bake for 35 minutes, until well browned on top and sounds hollow when tapped on bottom. Brush the top of the loaf with softened butter. Invert the pan and turn out the loaf onto wire rack to cool. Yield: 1 loaf. Variation for Cornmeal-Crusted Rye: Instead of all rye flour, use 1/4 cup semolina flour, 1/4 cup buckwheat flour, and 3/4 cup rye, plus 1 tsp. each fennel and caraway seeds. During the kneading process, use approximately 1/2 cup additional all-purpose flour for a denser free-formed dough, and let it rise. Shape into soft smooth round boulé loaf and place on cornmeal dusted oiled baking sheet to rise again. 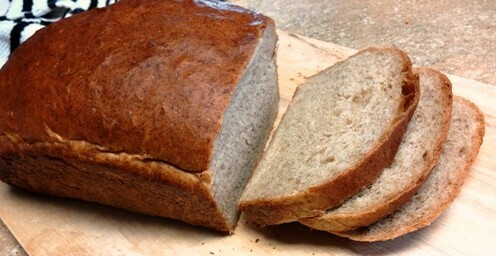 Before baking, brush the loaf top with a glaze of 1 beaten egg white plus 1 Tbsp. water, and sprinkle with more cornmeal if desired. Slash top with a sharp blade to form cross-hatch mark; bake at 375° for 35 minutes, until well browned.